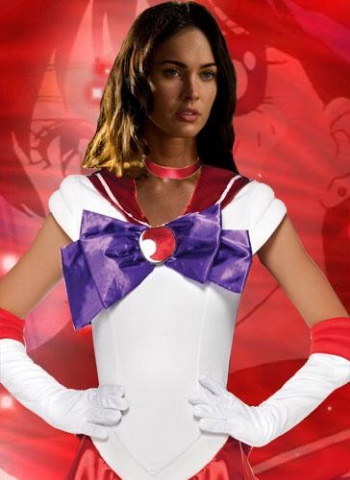 Teenage Mutant Ninja Turtles' April O'Neil, Megan Fox, states she'd love to do a live-action Sailor Moon movie, or even one based on Gundam Wing. While Megan Fox has already appeared in live-action iterations of cartoon flicks such as Transformers and the soon-to-be-released Teenage Mutant Ninja Turtles, the actress is open to doing more cartoon remakes to turn into live-action features. Talking to Entertainment Weekly about her role as April O'Neil in Teenage Mutant Ninja Turtles, Fox was asked about her future projects and what would her choice be if she can remake another animated series. "Gundam Wing," responds Fox, adding she'd love to see a Jurassic Park remake in the works. "Pacific Rim was sort of a Gundam Wing situation, but they should do it. What about Thundercats?" Or maybe, she says, Sailor Moon. "That could feasibly be made into a live action movie," mulls Fox. "I don't know how many Americans were into that. I was into that, but I don't know how huge it was here." "That's not actually a bad idea. Fox as a Sailor Moon character and in live-action? Count me in! Of course, I wouldn't mind seeing her in a Thundercats movie either. I can already guess she'd be a perfect fit for Cheetara. While you might already be imagining Fox in Sailor Moon attire, you might want to check out the trailer for her upcoming flick, Teenage Mutant Ninja Turtles, which is set to hit theaters this coming August. Would you want to see Fox in a Sailor Moon movie? Yeah, not an easy question to answer, I know. But aside from that, which other cartoon property would you want Fox to star in next?